Switch between instruments and mics simply and quietly with this rugged, latching footswitch. The balanced Radial Engineering HotShot ABi line selector instantly changes between 2 signal sources by depressing a latching footswitch. As the HotShot ABI is completely passive, a power source is not required. he Radial HotShot ABI input selector makes signal diversion control as simple as turning on or off. Radial arms the HotShot ABI with grounding options and level adjustments to make it suitable for a wide variety of live sound applications. Critical to the HotShot's performance is its rugged 14-gauge steel construction and ultra compact footprint. Use the HotShot ABi in the most demanding professional applications while enjoying years of trouble-free performance. The HotShot ABi is ideal for applications such as switching between 2 dynamic microphones on a stage or selecting between 2 audio sources. The latching switch also opens the door for other useful operations, such as using the HotShot ABi as a microphone mute; to select between 2 wireless receivers for live sound system backup; to select between 2 stereo guitars; or to provide the moderator with remote control over 2 audience microphones for community events. Ultra compact and extremely rugged, the Radial HotShot ABI s made tough for years of reliable use performance. 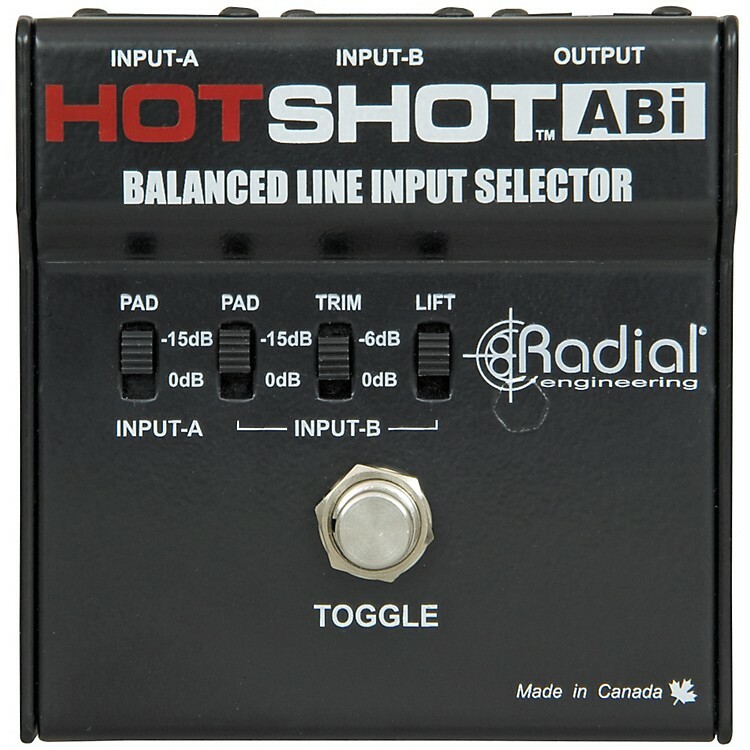 Radial backs the HotShot signal switch with a 3-year transferable warranty. Easy-to-use, this passive footswitch with Radial's renowned signal transparency gives you control over two sound sources. Order today!